Only spending four hours of your life in London would be a tragedy, so let's assume that your short layover is just the first of many trips to the British capital. That being said, a quick stopover offers a great opportunity to get a tiny taste of what to look forward to when you return for a longer visit. Here are three different ideas for what to do with your four hours. While the Underground offers a handy connection between central London and Heathrow Airport, it takes about an hour, so forget about taking it on a tight schedule. Instead, look for the Heathrow Express train, which runs every 15 minutes and gets you to Paddington Station within 15 minutes. The Gatwick Express runs just as frequently, but takes around 30 minutes to get to Victoria Station. If you are planning to return to London for a longer visit, it is worth purchasing an Oyster Card to use on the Undergound and buses and topping it up as you go. The cost for a new Oyster Card is £5 (about $7.85) and with that a single tube fare in central London will cost you £2.10–£2.80, while paying cash for a single trip will cost you £4.50. Hyde Park lies between Paddington and Victoria, so this can be an easy first stop wherever you are coming from. From Paddington you can take the number 46 bus to just outside Hyde Park, and from Victoria, the number 52. On both these routes, the bus is as quick as the tube and has the added bonus of scenery along the way – particularly on the double-decker 52, which travels past the white stucco houses of Belgravia. With 630 acres of park and gardens, you might want to spend your whole layover in the park. 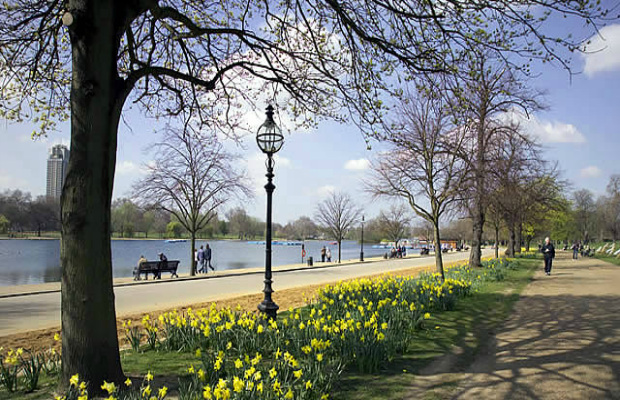 Highlights include the Serpentine Lake, which officially divides Hyde Park and Kensington Gardens. If you are lucky enough to be visiting London in summer, when it is at its most glorious, you can take a dip in the Serpentine Lido, otherwise you can see the unconventional Diana, Princess of Wales Memorial Fountain, and check out an exhibition at the Serpentine Gallery of art. Over in Kensington Gardens, don't miss the 176-foot Gothic Revival Albert Monument, which was commissioned by Queen Victoria to honor her much-loved Prince Albert, and the nearby Royal Albert Hall. If you happen to be in Hyde Park on a Sunday morning, head for Speakers' Corner to catch an always entertaining collection of free-speech advocates orating on their most passionately held opinions. Upon leaving Westminster tube station, you will immediately see London's most recognizable image: Big Ben. 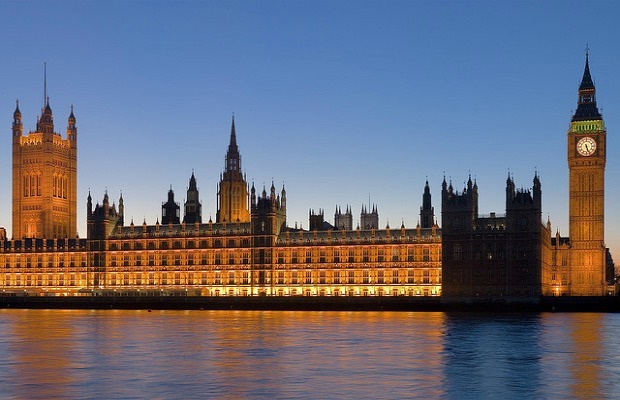 Stroll along the Thames and take in all the sights clustered around this area: the Houses of Parliament, Westminster Abbey, the bronze statue of Boudica riding her war chariot, and, across the river, the London Eye. Keep walking along the Victoria Embankment past Cleopatra's Needle, then cross the Thames via Waterloo Bridge, from where you will get an excellent view of London's skyline, including St. Paul's Cathedral and "the Gherkin" skyscraper. From there it is about a 20-minute walk along the South Bank to the Millennium Bridge. You will often come across street performers and street fairs along this route, and you will pass the Shakespeare's Globe, a reconstruction of the Elizabethan playhouse associated with William Shakespeare. If you have even a little spare time, pay a visit to the Tate Modern, behind the southern end of the Millennium Bridge. Entrance to the permanent collection of modern and contemporary art is free. 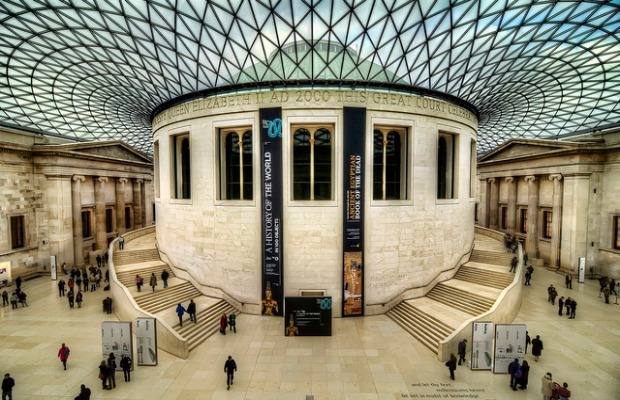 The British Museum is one of the world's great museums and its collection of eight million or so exhibits is one of the largest in existence. Don't even try to see everything on a short visit, instead focus on some of the highlights, such as the Egyptian mummies, Rosetta Stone, and Elgin Marbles. The museum is free to enter and the closest tube station is Russell Square. From the British Museum it is a short walk down Shaftesbury Avenue to Covent Garden for shops, restaurants, and street performers. Keep walking until you find yourself in the colorful Soho district where the creative energy that drew the likes of Rimbaud, Marx, and Bowie still thrives. Stop for an espresso at the legendary Bar Italia on Frith Street or wander farther along Old Compton Street and step in to the Patisserie Valerie and relax with a coffee and pastry until it's time to head back to the airport.